Maybe it's for work, maybe it's for play. Maybe both. But when you take your tech entourage on the road, you want to go light--and in style. You don't want to disconnect from the world or from your entertainment, so you often eyeball magazines and Web sites (PC World first among them, of course) to learn about the latest, sleekest ultraportables on the planet. Before you hop on that Lear jet or set sail on that yacht, read on for help in choosing your ideal traveling companion. Ultraportables usually have CPUs that are sprightly enough to power through basic documents and score in the 80s in WorldBench 6. That may not seem lightning-quick, but it's more than twice as fast as your garden-variety netbook. 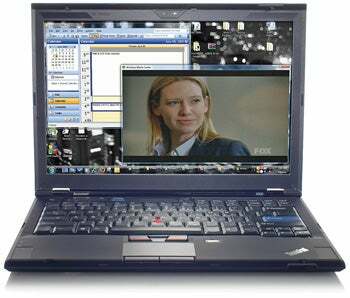 (The Lenovo ThinkPad X200, for example, has a 2.4GHz Intel Core 2 Duo P8400 and notched a mark of 88.) Of course, the average ultraportable starts at $1500 versus $400 for an Atom-powered netbook, so be glad you can afford to travel first class. Thin-and-light laptops need all of the help they can get to wrangle Windows Vista. If the notebook you have your eye on comes standard with 3GB of RAM, upgrade to 4GB. And if you hope to actually use all of that RAM, make sure that you have the 64-bit version of Windows installed. I have to give ultraportable makers credit: Many try to shoehorn GPUs into their machines. The inconceivably thin Apple MacBook Air, for instance, makes room for an nVidia GeForce 9400M, a discrete graphics card perfectly capable of playing games. Most business ultraportables, however, use integrated GPUs and can barely handle Vista. If all you care about is watching a couple of movies on your next flight to Ibiza, you should be able to squeeze out enough performance from an integrated GPU. Want high-quality HD? Consider a discrete graphics card. Ultraportable screens max out at 13.3 inches. As for screen resolution, don't expect much more than 1280 by 800 pixels. On any system you consider, make sure the display is large enough and sharp enough for you to read without developing eyestrain. Thanks to ultraportables' light weight, strapping a high-capacity battery onto one is easy to justify. With the extra battery capacity, the Lenovo X200 lasted for nearly 9 hours in our tests, while the HP EliteBook 2530P survived for roughly 7 hours. If nine-cell batteries are available for your potential laptop, look into them. Try to lay your hands on an ultraportable before you buy it. Take special note of the size of the touchpad and the keyboard; manufacturers usually end up making one too small. Many paper-thin ultraportables, like the MacBook Air and the Samsung X360, ditch the optical drive. Others, like the Lenovo ThinkPad X300, somehow slip one in. I'll always opt for one with an optical drive, but your needs may vary. A machine in this class will weigh, at most, 4 pounds. The biggest factor is the battery--especially if you get a nice, big battery for long flights. Thin-and-lights are focused on Internet access, anywhere. Beyond 802.11n Wi-Fi, you'll find that many ultraportables these days offer Wireless WAN capability. A large solid-state drive (SSD) offers plenty of storage room but takes up very little physical space inside the computer. Though their costs are coming down, SSDs still tack a bit onto the price of an already-expensive ultraportable. Priced at $2057, Lenovo's ThinkPad X300 is thin and light but has an optical drive and an array of ports. It isn't the speediest machine, but we like the Lenovo ThinkPad X300. Thin and a little more straitlaced than the MacBook Air, the X300 is a superthin-and-light (3.4-pound) laptop with an optical drive and plenty of ports. Naturally, like any good ultraportable, it'll cost you--a lot. Our review configuration was $2057.